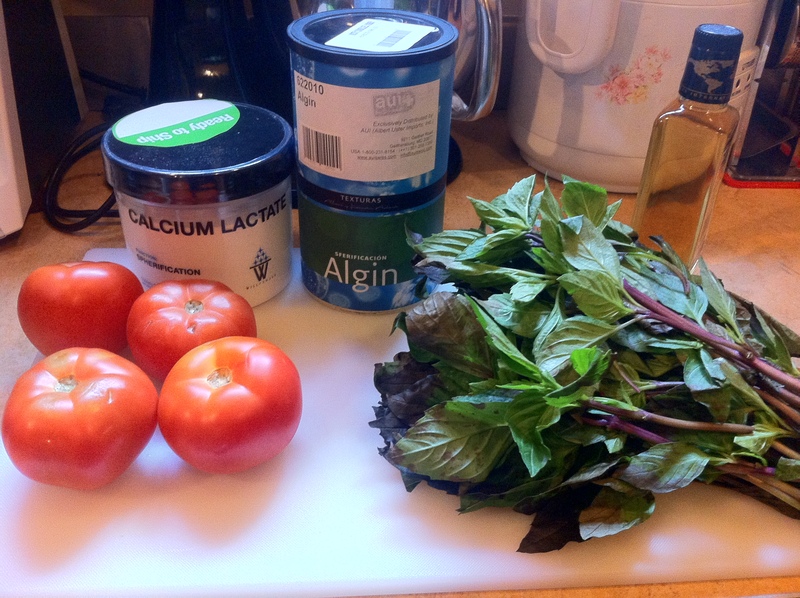 The ingredient list was straight forward – tomatoes, basil, oil, and a couple of additives. The first task was to make tomato water: to take perfectly round tomatoes and disintegrate them so I could make them round again. Sometimes you have to destroy the village in order to save it. But I was going to go the quick route by using my centrifuge to spin the water out of the pulp. Why wait for hours when 20 minutes will do? 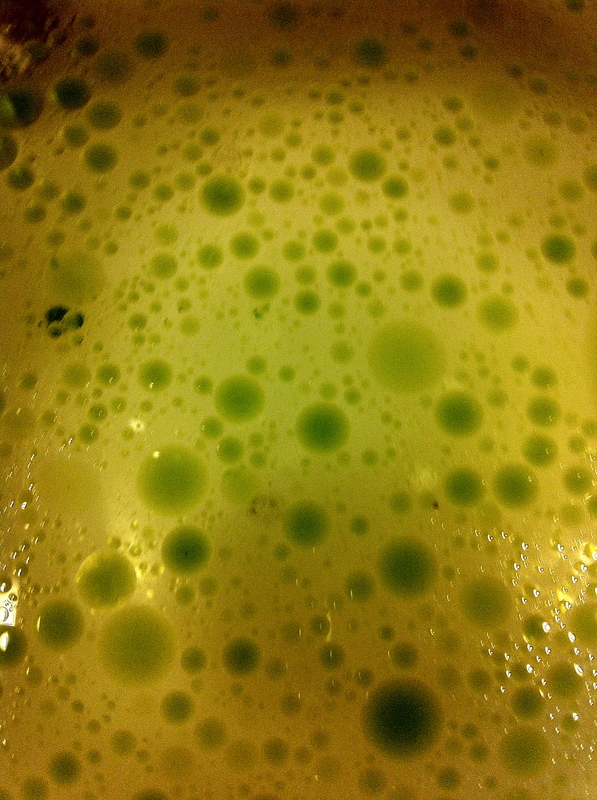 With the tomato water ready, next up was the creation of basil oil. 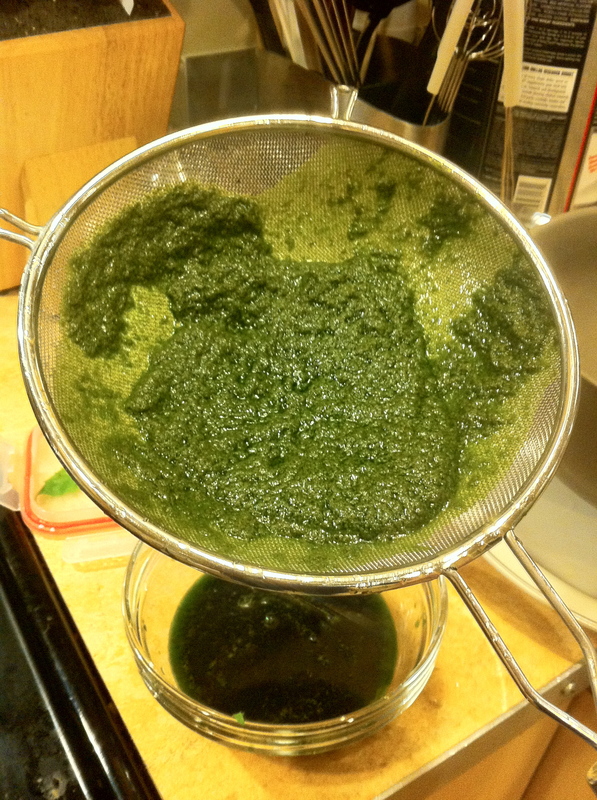 After blanching and shocking (to retain the bright green color) the basil, a quick whipping in the Vitamix with a neutral oil and subsequent straining got me the green gold I was looking for. 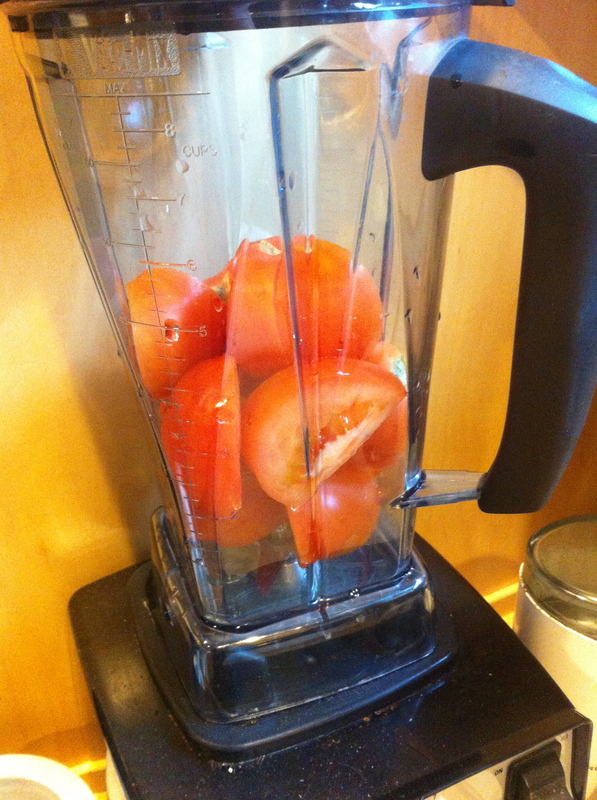 I was ready to reconstitute the tomatoes into a new form of their higher selves. With my components prepared, it was time to put it all together. As usual, things didn’t quite go as planned, so improvisation was necessary. 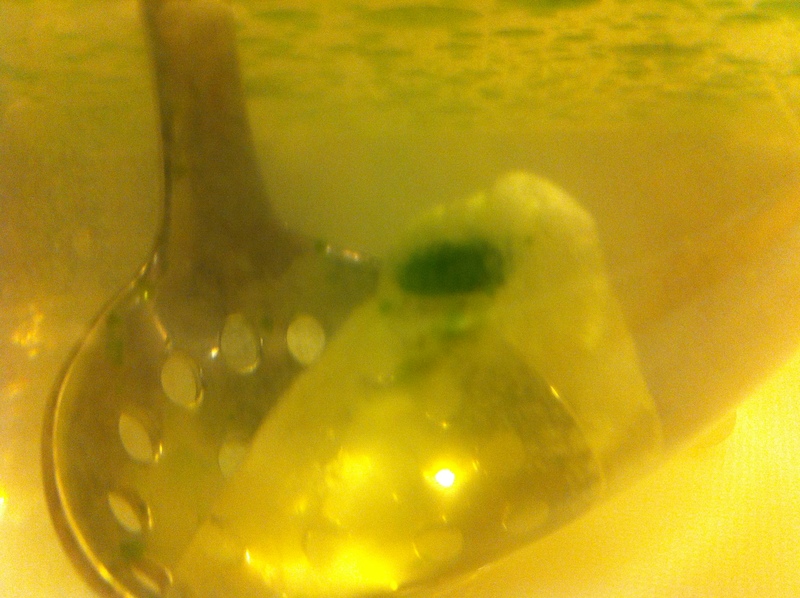 I made my water bath with calcium lactate, and two water baths beside that. 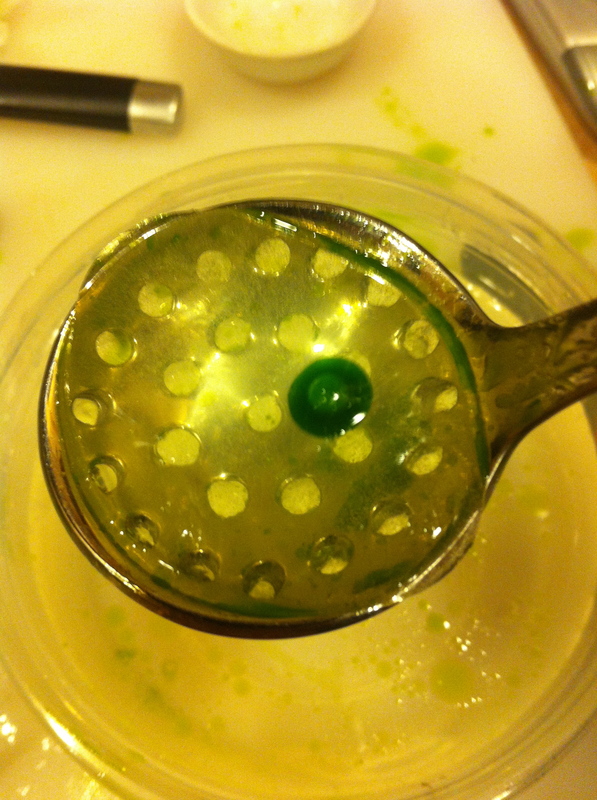 Calcium lactate often leaves a bitter taste, so you need to rinse of your completed spheres at least twice to remove the off-flavors. 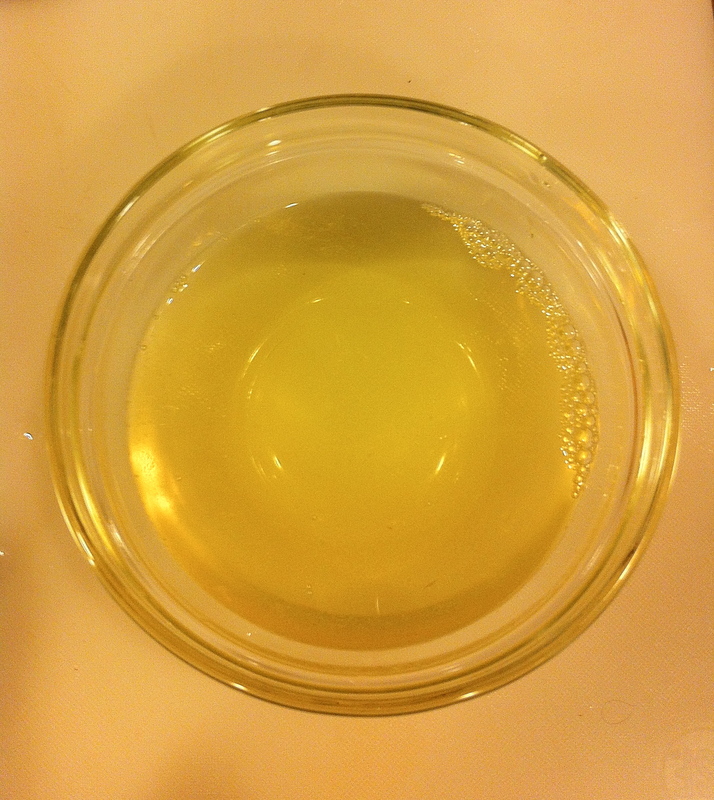 Next, I mixed the tomato water with Algin from Texturas, the company created by the Adria brothers. It’s sodium alginate, but apparently it is more refined than most brands. 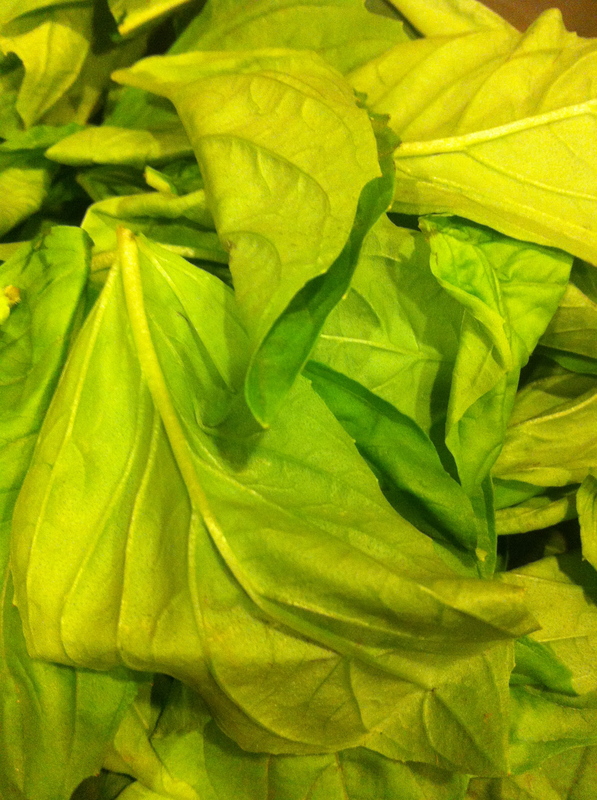 It uses only the part of the algae where the reactivity to calcium and texture is best. Anyway, it’s the suggested alginate in the recipe as well, so might as well do it right. The next steps were to spherify the tomato water, then inject the basil oil into the sphere while the skin was forming around it. Here I hit a snag. 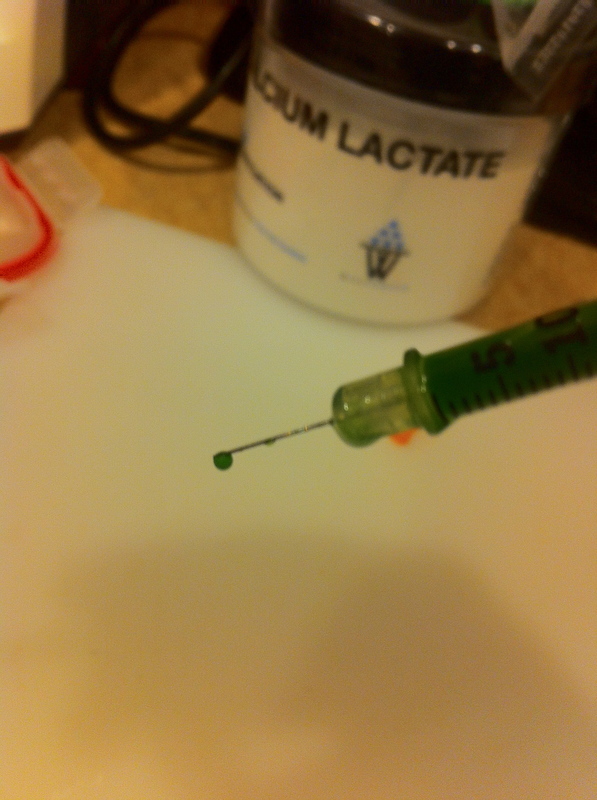 Turns out the needle I was going to use to inject the basil was much too small for the oil droplets. This was, of course, annoying. I had everything set up and ready to go. I rummaged around my drawers and found a plastic eye dropper. Perfectly fine for making caviar but for injecting into a sphere? Well, let’s find out. 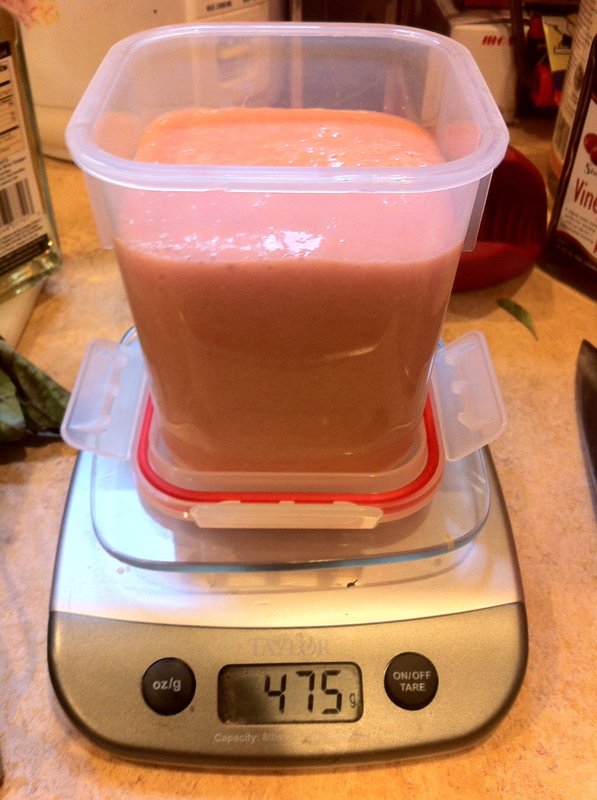 I put my first tablespoon was tomato-alginate into the calcium bath. I waited about 30 seconds, then inserted the eye dropper into the sphere and pushed the oil into it. I pushed too hard. Lovely. My calcium bath was now an oiled mess. But I forged ahead, and was able to create several of the little suckers. So I did it and worked as planned. You pop the sphere into your mouth. With slight pressure from your tongue, the tomato water and basil oil rush out and coat your mouth – a quick burst of Italian cuisine that comes and goes in an flash. Quite delicious. I think a great variation would be to freeze the spheres, then cover them in mozzarella to make little Insalata Caprese balls. You would bite into a liquid tomato/basil center – that would be sweet. But that would be hard to do right now because they weren’t perfectly spherical. In the Modernist Cuisine photo, they look as round as eyeballs, but in reality, they tend to flatten out a bit. Could it be there is something in the technique I’m missing? At first I would say no. 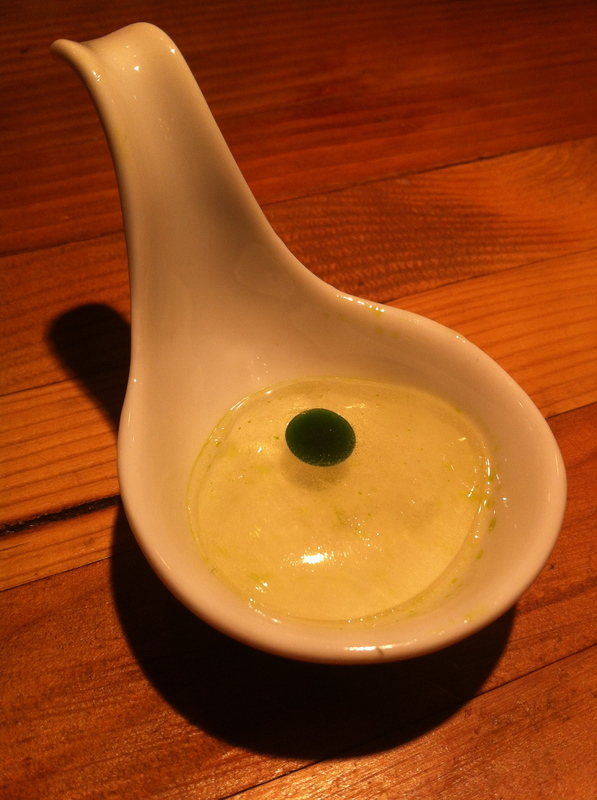 When I had the opportunity to have the elBulli menu at Next, their olive spheres were not perfectly round – they formed to the shape of the spoon. 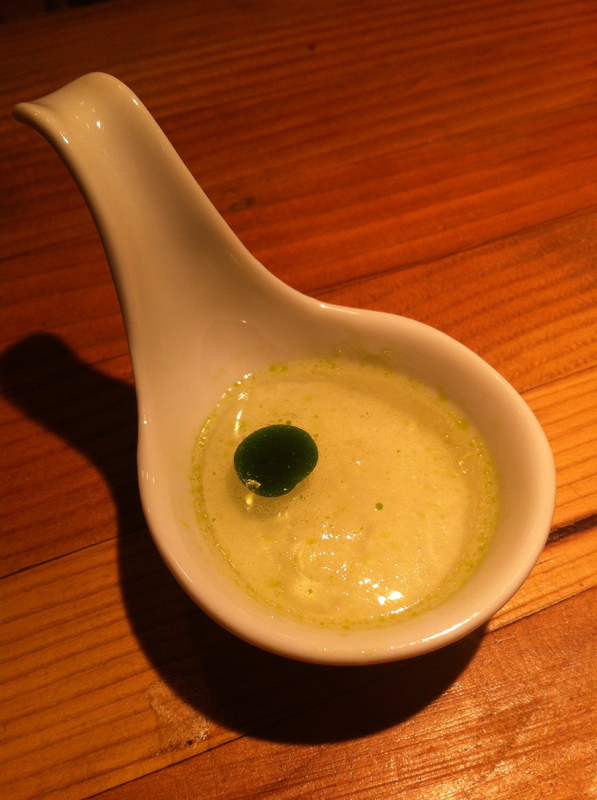 But I’ve seen diner photos from elBulli where they seem nice and fat and are more spherical. There must be a way to achieve the perfection of a sphere! It is something that deserves more research. In the meantime, I’ll pop, burst, taste and reflect on it. Storing them in the base liquid (sans alginate) plumps them up, they reabsorb some of it. Don’t know the science behind trick this but it definitely works.